Greg Land leads the visual side of the creative team and while his artwork isn’t always my cup of tea, I have enjoyed some of his past X-Men work. That said I chose to use Ken Lashley’s variant cover as the key image for this post rather than Land’s regular cover. Creative team aside, it’s the “Uncanny” in the title that’s going to get me in the door every time as it has for nearly all of the previous 600 issues bearing the name. Hopefully, this series provides a stronger debut than the recently launched Extraordinary and All-New X-Men titles. 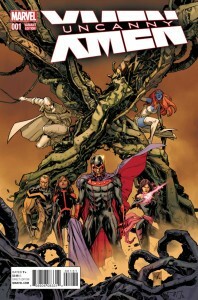 – Cullen Bunn, Greg Land, Jay Leisten and Nolan Woodard’s Uncanny X-Men is published monthly by Marvel Comics. STAR WARS #14 – Vader Down Part 5 of 6. I’ve made no secret of my appreciation for Marvel’s Star Wars, and while Vader Down started out strong my interest is starting to wane. I think the characters from the Vader series (which I don’t regularly read) are a big part of the problem. I lost interest in the evil analogues of the heroes pretty quickly, and now that they’re starting to face off against one another I can’t wait for it to end. UNCANNY X-MEN #1 – See comments above. A-FORCE #1 – I like the idea . Didn’t buy the Secret Wars series. Still giving this a look. DOCTOR STRANGE #4 – I tried to be interested in this, but I’m struggling to get through the first few issues. Chris Bachalo’s art is what’s most appealing. I just don’t know that I care about Doctor Strange. Weekly comic books are a big part of my life and you can see what’s on my reading list each Wednesday here and on Reddit’s /r/comicbooks.